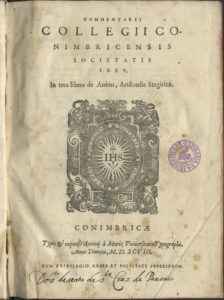 Being, by its size, the third largest volume of the Coimbra Jesuit Aristotelian Course (590 pp), the Commentarii Collegii Conimbricensis Societatis Iesu, In tres libros de Anima Aristotelis Stagiritae was published in Coimbra after March 1598, by the Printer António de Mariz (245x175mm). Its main editor, Manuel de Góis (born in 1543) had died in the previous year (1597), when the volume came out from the Press, which may explain the contribution of two more Portuguese Jesuits, viz. Baltasar Álvares (1560-1630), responsible for the text of the Appendix entitled Tractatus de Anima Separata, Treatise on the Separated Soul (pp. 441-532), and Cosme de Magalhães (1551-1624), probably the final editor of the volume and responsible for the text of the other Appendix, Tractatio Aliquot Problematum ad Quinque Sensus spectantium, Treaty on a few Problems related to the Five Senses (pp. 533-558). Publishing also with the King’s Privilege dated from 1572 (August, 25th according to the volume on Dialectica), the earlier date printed in this volume is September 24th1592, i.e. i.e. the same day that the three members of the Council of the Inquisition, António de Mendonça, Jacob de Sousa and Marcos Teixeira signed their permission related to the volumes of Physics, On the Heavens and On Generation and Corruption. If this indicates that all the three volumes were already finished in order to be appreciated by the Inquisition Counsel (which is more or less unlikely), then it should be said that the volume took six years to come out to the public. What was said about the time taken by On Generation and Corruption is more likely to have happened with On the Soul. Besides, we know that the agreement about the printing of this volume was signed together with On Generation and Corruption (AUC IV-1ªD-25-3-11), in June 14th, 1596, by Pedro Gonçalves, acting on behalf of the College of Jesus, and the publisher António de Mariz. Not having an explanation for the delay, what is certain is that the representatives of the Senate had signed by December 23rd, 1595, their permission, and that the Count-Bishop of Coimbra only signed his own license in March, 6th, 1598. The volume On the Soul follows the method used by the greater volumes of the Coimbra Jesuit Aristotelian Course. As happened with the Physica, the De Caelo, the De Generatione and Corruptione and will happen too with the Dialectica, the De Anima is published with the Latin version of Aristotle’s text surrounded with the philological section (explanatio) and the various questions, all divided into several articles. It must, however, be noticed that the two appendixes have two different approaches, the one by Baltasar Álvares follows the style already used in the Meteorology – but instead of “treatise” Álvares uses the term “disputation” each one further divided into articles – and the one by Cosme de Magalhães, the method already used by Góis in the appendix of On the Heavens, i.e. discussing a few problems in each one of the several sections in which the Treatises were divided. In both Treatises, as well as at the end of the various titles of the Parva Naturalia, the pseudo-Aristotelian Problemata Physica is the key text for Góis’ and Magalhães’ selective editorial intervention. Finally, On the Soul is also published with a summary of all its chapters and questions, in its beginning, and finishes with an Index of subject matters alphabetically ordered (19 pp), in its end. With the exception of the volume of the Dialectics, On the Soul publishes in their cover the logo of the Society of Jesus, with the Latin motto, “Nomen Domini Turris Fortissima”.